In a word: Find the building, wait in line, it'll be worth it. JM and John ate a ham and pepperoni pizza with root beers. Nichole ate the butternut squash soup with Fat Squirrels. The bill was ??? - thanks, John! JM and Nichole gave Greenbush Bar an A; John gave Greenbush Bar a B+ (see our grading rubric). Greenbush Bar has gotten some well-deserved attention in the major papers in the last year or so. 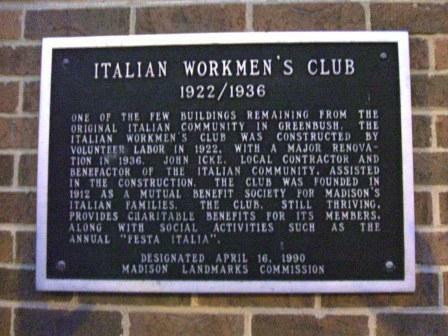 As well it should, being a Madison landmark in the basement of the Italian Workmen's Club. Inside, warmth and hospitality immediately envelops you. Standing under the holiday lights on the ceilings, waiting for a table, John said he felt like he was having lots of good, little ideas. It was a bit of a wait, but we weren't surprised that there was a crowd. It was Friday night of homecoming weekend. Plus, the bar was there to lighten the wait - and although we didn't take a seat, choosing to mill about the coat rack, Nichole did avail herself of its services and got a Fat Squirrel to sip on while peoplewatching. We started off with the peasant bread and roasted garlic. It was fun. 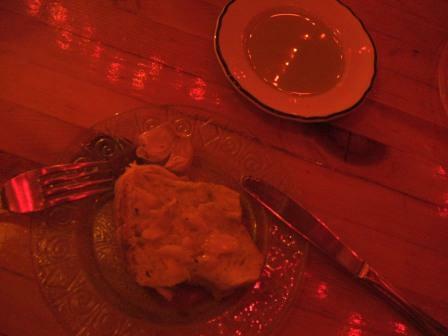 The bread was soft yet full of flavor, the olive oil was very high quality, and the herb-roasted garlic cloves squished out of their papery skins so smoothly that we ate the whole head between us. The pizza is everything it's cracked up to be. The crust was light and totally "inobtrusive," and JM just loved it. He noted he'd not had a pizza with as good a balance between crunchy and chewy crust and the toppings were added perfectly. John, too, liked the pizza. 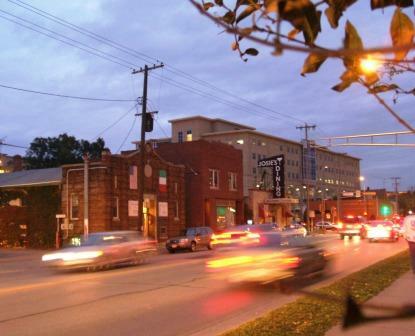 He noted that Greenbush Bar is a nice date locale with fine home-style food, which is very welcome. He'd easily come back. The squash soup Nichole had was everything you could want in an autumn soup: rich and thick, satisfying, and warm. 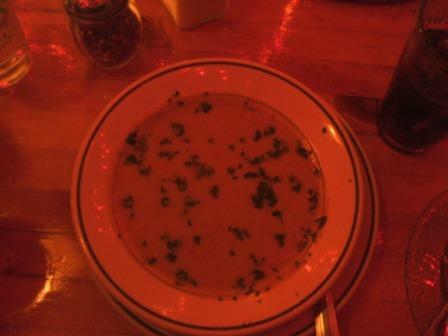 The waitress said the soup-of-the-day was a new thing, and if this bowl was any indication, it will be a hit. We weren't surprised to see Greenbush Bar on the list of Farm Fresh Atlas supporters and Just Coffee servers - the quality ingredients are obvious. Our only regret was not having room for dessert: cannoli, key lime pie, tiramisu, and caramel creme all looked lovely, but as so often happens, we were too stuffed. I could eat at Greenbush Bar everyday. Definitely one of my Madison faves. Their pizza and vegetarian antipasto is delish! Went there at 6pm for dinner with my girlfriend, was seated and given a menu. After 10 minutes a server came over and asked for our ID's we told her that we were not purchasing alcohol, had walked over (we live 4 blocks away) and did not have them. We were then denied service, had our menus taken away and rudely told to leave immediatly. I will never go back to Greenbush after this rude treatment, and will cannot recommend this shady establishment to anyone, avoid it like the plague. Restrictions. An underage person not accompanied by his or her parent, guardian or spouse who has attained the legal drinking age may not enter, knowingly attempt to enter or be on any premises for which a license or permit for the retail sale of alcohol beverages has been issued, for any purpose except the transaction of business pertaining to the licensed premises with or for the licensee or his or her employee. The business may not be amusement or the purchase, receiving or consumption of edibles or beverages or similar activities which normally constitute activities of a customer of the premises. In other words, if you're delivering the newspaper, you can enter. If you're buying a burger, better have your ID. I'm not saying the treatment wasn't rude (it might have been), or that the server couldn't have been more accomodating or understanding (that certainly seems to be the case). What I am saying is that you're going to buy a meal at a place with "Bar" in the name. It's caveat emptor if you leave your ID at home. It's not called the Greenbush Happy Children's Fun Land. Cut 'em some slack. Hands down the best pizza in the Madison area. Remarkable thin crust in a quiet, dark, laid-back atmosphere. I received some of the best service ever there. We were a party of six on a Friday night. There was a long wait and the bar was crowded. We went next door to the liquor store and bought a 6-pack of beer and drank it in the Hospital parking lot. The hostess had our cell phone number to call when the table was ready. Evidently, the phone didn't work and SHE CAME ACROSS THE STREET TO THE HOSPITAL LOT TO TELL US OUR TABLE WAS READY! Now, we didn't tell her we'd be there and the place wasn't hurting for customers. She simply said "It's probably where I would have been, too." Amazing. As for the food, it's always good and I'm always pleased. Good wine selection and they make a decent old fashioned. And really, we're nice people even though we drink beer out of paper bags in parking lots. Really. Heh! How cool was that. Greenbush is great. I still haven't had time to try Greenbush's pizza. Anybody know if they do carryout (well)? Are they cool with call aheads? GB does carryout and you can call in your order. The pizza wil be good but not the same as eating in house. Far and way the best pizza place in Madison. Excellent service (when school starts they oten have newer staff so cut them a bit of slack in the fall), great food, and well poured drinks. We had dinner there tonight, and didn't order the pizza (which most people do) - it was quite good. We had a "crostini" (wasn't really crostini) that was wonderful, with goat cheese, tomatoes, and artichokes. For dinner we had the pasta with white clams, and the calamari with red sauce - both were good. Nice selection of micro brews and wines. Good value! Still haven't made it to the bar, but the Workmen's Club puts on one hell of a pasta dinner. I was happy to see that a gluten-free pasta was added to the menu! Yay! Now I like the Greenbush even more that I did before. I had the smoked salmon pasta with this wheat-free alternative and it was fantastic. Dinner at the Greenbush is perfect. Gretchen and Anna serve simple foods perfectly, and have one of the best bar/restaurants in town. The scotch, bourbon, grappa, and tequila lists are smart, extensive and affordable (Gretchen once said it wasn't neighborly to overcharge). The deserts are homemade, the bread is home-baked, and the pizza is the best in town. We ate here last night and it was DIVINE. In a time where Glass Nickel tastes more and more like cardboard and Pavlov's has closed down, it's good to still have a gourmet pizza place in town. 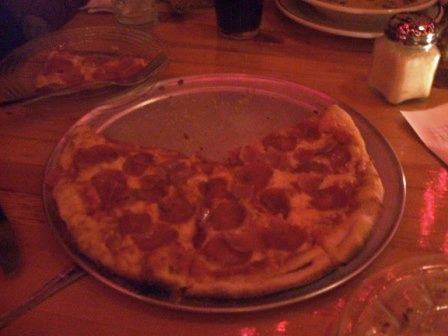 I miss Madison eating, and most of all I miss the pizza at Greenbush. So delicious.